You don't have to be Australian to appreciate the beauty and graceful nature of the powerful kangaroo. They are herbivores that can be found throughout Australia, Tasmania, and New Guinea, and have been an integral part of Aboriginal culture for thousands of years. From inspiring local legends to being the prominent source of protein for many Aboriginal tribes, the kangaroo has been one of the central figures in Aboriginal culture, art, and way of life for thousands of years. Their name comes from the Guugu Yimithirr word ganguru. The Guugu Yimithirr tribe have populated Far North Queensland for thousands of years. There's a myth surrounding the word kangaroo. When early British explorer, Lieutenant James Cook, first encountered the animal in 1770, it is said that he turned to a nearby Aborigine and asked him what the animal was. History has mistakenly recorded that the local's response, "Kangaroo", as the Guugu Yimitthirr phrase for "I don't understand". Of course, this legend has now been debunked. For the most part, kangaroos travel in mobs of ten or more and are fiercely protective of weaker members and joeys (baby kangaroos). The fact that Roos have thrived despite the devastation brought onto their territory by early English settlers, has led many to associate resilience and adaptability with these naturally curious creatures. While their tiny forearms are relatively weak, their hind legs are notoriously powerful and can easily disembowel enemies with one swift kick. Kangaroos often balance on their extremely strong tails while 'boxing' with rivals, which has lead to the sometimes frightening reputation of these powerful animals. But despite that misconceptions, kangaroos rarely attack humans. In fact, they have more reasons to be terrified of us than we should be of them. 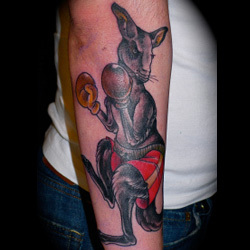 By far the most popular Kangaroo Tattoo are the Boxing Kangaroo Tattoos. This type of ink was inspired by the animal's tendency to box when fighting a rival male. This quickly lead to the practice of some humans strapping boxing gloves on helpless kangaroos for amusement. Having this artwork shows that you're a fighter who's willing to do whatever it takes to stand up for yourself and others around you (kangaroos tend to fight when their young is threatened). You will not back down. 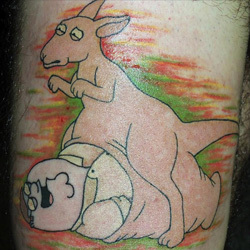 Most kangaroo tattoos have cartoon elements incorporated into their designs. From Kangaroo Jack to hilarious drawings of boxing kangaroos, having a cartoon kangaroo tattoo shows off your comical, fun-loving side. 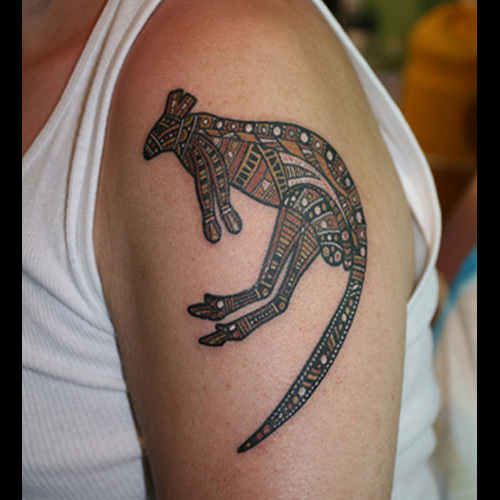 Most tribal kangaroo tattoos are inspired by the incredible beauty and rich colours of Aboriginal art. Like most tribal patterns across the world, Aboriginal artwork was a means of expressing one's connection to the divine elements of the universe and to the stable, nurturing presence of Mother Earth. 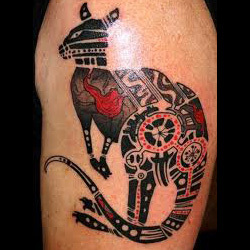 tribal kangaroo tattoos pay homage to the culture to which the piece is native (be it Aboriginal or otherwise) and expresses your connection to this powerful animal totem. Showing off your fighting spirit with the right kangaroo Tattoo can be a tricky undertaking. You have to think about what your new tattoo will symbolize, where you'll place it on your body, and whether or not it really fits your overall style and persona. Your ink isn't easily erased, so it pays to spend some time getting the design details right. Need inspiration? Then visit our design page at www.itattoodesigns.com and take advantage of our Custom Design Service. Our team will be more than happy to help design a truly unique piece for you.